Her fists a blur as they deflect an incoming hail of arrows, a half-elf springs over a barricade and throws herself into the massed ranks of hobgoblins on the other side. She whirls among them, knocking their blows aside and sending them reeling, until at last she stands alone. Taking a deep breath, a human covered in tattoos settles into a battle stance. As the first charging orcs reach him, he exhales and a blast of fire roars from his mouth, engulfing his foes. Moving with the silence of the night, a black-clad halfling steps into a shadow beneath an arch and emerges from another inky shadow on a balcony a stone’s throw away. She slides her blade free of its cloth-wrapped scabbard and peers through the open window at the tyrant prince, so vulnerable in the grip of sleep. Whatever their discipline, monks are united in their ability to magically harness the energy that flows in their bodies. 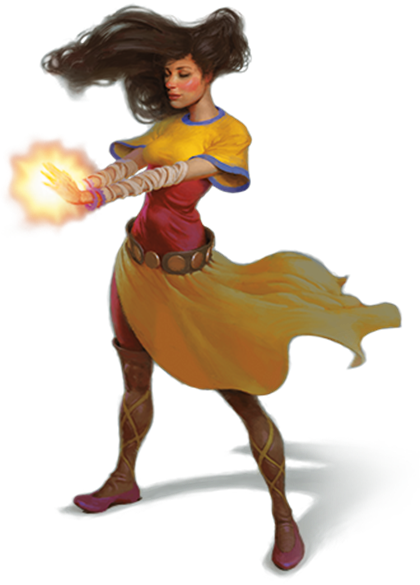 Whether channeled as a striking display of combat prowess or a subtler focus of defensive ability and speed, this energy infuses all that a monk does. Monks make careful study of a magical energy that most monastic traditions call ki. This energy is an element of the magic that suffuses the multiverse—specifically, the element that flows through living bodies. Monks harness this power within themselves to create magical effects and exceed their bodies’ physical capabilities, and some of their special attacks can hinder the flow of ki in their opponents. Using this energy, monks channel uncanny speed and strength into their unarmed strikes. As they gain experience, their martial training and their mastery of ki gives them more power over their bodies and the bodies of their foes. Small walled cloisters dot the landscapes of the worlds of D&D, tiny refuges from the flow of ordinary life, where time seems to stand still. The monks who live there seek personal perfection through contemplation and rigorous training. Many entered the monastery as children, sent to live there when their parents died, when food couldn’t be found to support them, or in return for some kindness that the monks had performed for their families. Some monks live entirely apart from the surrounding population, secluded from anything that might impede their spiritual progress. Others are sworn to isolation, emerging only to serve as spies or assassins at the command of their leader, a noble patron, or some other mortal or divine power. The majority of monks don’t shun their neighbors, making frequent visits to nearby towns or villages and exchanging their service for food and other goods. As versatile warriors, monks often end up protecting their neighbors from monsters or tyrants. For a monk, becoming an adventurer means leaving a structured, communal lifestyle to become a wanderer. This can be a harsh transition, and monks don’t undertake it lightly. Those who leave their cloisters take their work seriously, approaching their adventures as personal tests of their physical and spiritual growth. As a rule, monks care little for material wealth and are driven by a desire to accomplish a greater mission than merely slaying monsters and plundering their treasure. As you make your monk character, think about your connection to the monastery where you learned your skills and spent your formative years. Were you an orphan or a child left on the monastery’s threshold? Did your parents promise you to the monastery in gratitude for a service performed by the monks? Did you enter this secluded life to hide from a crime you committed? Or did you choose the monastic life for yourself? Consider why you left. Did the head of your monastery choose you for a particularly important mission beyond the cloister? Perhaps you were cast out because of some violation of the community’s rules. Did you dread leaving, or were you happy to go? Is there something you hope to accomplish outside the monastery? Are you eager to return to your home? As a result of the structured life of a monastic community and the discipline required to harness ki, monks are almost always lawful in alignment. You can make a monk quickly by following these suggestions. First, make Dexterity your highest ability score, followed by Wisdom. Second, choose the hermit background. Certain monasteries use specialized forms of the monk weapons. For example, you might use a club that is two lengths of wood connected by a short chain (called a nunchaku) or a sickle with a shorter, straighter blade (called a kama). Whatever name you use for a monk weapon, you can use the game statistics provided for the weapon in the Weapons section. When you reach 3rd level, you commit yourself to a monastic tradition: the Way of the Open Hand, detailed at the end of the class description or one from another source. Your tradition grants you features at 3rd level and again at 6th, 11th, and 17th level. At 6th level, your Unarmored Speed speed bonus increases to 15 feet while you are not wearing armor or wielding a shield. At 9th level, you gain the ability to move along vertical surfaces and across liquids on your turn without falling during your move. At 10th level, your Unarmored Speed speed bonus increases to 20 feet while you are not wearing armor or wielding a shield. At 14th level, your Unarmored Speed speed bonus increases to 25 feet while you are not wearing armor or wielding a shield. At 18th level, your Unarmored Speed speed bonus increases to 30 feet while you are not wearing armor or wielding a shield. Seems like Way of the Sun Soul should get the Light cantrip. I'd really like it if DnD Beyond updated it so that I can see what I was missing. Right now the only way I know I'm missing something is because of the "this thing is missing" comments. I guess I'm glad they don't because I'd probably be spending a lot on micro transactions to unlock features. But on the flip side it'd be really helpful if I didn't have to go to the marketplace and guess which books contain what. The Racial unlocks are pretty clear, but class and background based unlocks are too ambiguous... or maybe I just failed my investigation check. Also it helped me a lot to decide which contents to buy. I appreciate the feedback and no worries re: typos! I have been alt+tab'ing these wikis pretty often as I daydream new builds. I just really like what DnD Beyond is trying to do for the game and the community. Especially considering their support for A26LA I would very much like to be able to do all my build planning in one spot. Just a wish list item, not a real gripe. Do you get a attack of opportunity on this person? Hum... i think you can't make a opportunity attack because it's not a drop of guard. Think in a person been pushed back but keeping his guard, like Goku or something. "...You also don't provoke an opportunity attack when you teleport or when someone or something moves you without using your movement, action, or reaction..."
Awesome, thanks for taking the time to answer my question! Any creature who is unwillingly moved, does not provoke attack of opportunity. A creature must willingly move through the attack range in order to provoke attack of opportunity. Its in the PHB. Reason being, you could essentially cause SO MANY opportunity attacks this way and it would kind of break combat. The books say what they contain, but I have no way of knowing what that means without going through all the back doors I already was going through. Sure it says it has, lets say, "The Way of the Kensei", which I am capable of guessing means a Monk Way, but I have no idea if that is a way I might consider using for my character without paying at least $2 for it. I mean, may be a cheapskate (who isn't?) but I wish that there was a quick blurb to describe everything. Knowing that the Kensei are attached to weapons and that the Sun Soul can use magical light would really ease my mind in the character creating process. I wish I had $360 dollars to throw into this, I really, really do, but for now I am stuck borrowing books from my friends and searching online to decide my characters before I can even begin the process on DnD Beyond. No, forced movement does not create opportunity attacks, sadly. The elemental disciplines are missing their level requirements. Is there no built in option to the character sheets to add the monastery, monastic icon & master options from XtGE to character sheet? I guess I'm more upset that those backstory options don't show up on the monk page. Water Whip isn't showing in my actions list on my character sheet. I wan to have the way of the tranquility that was in UA. If you have racial proficiency in a weapon or armor, does the monk class limitations supersede this? For example, a monk does not get proficiency with a longsword. However, if playing as an Elf, you get the Elven weapons training proficiency. You are still proficient (so you add your proficiency modifier when you attack), but it doesn't count as a monk weapon (so you don't get the benefits of Martial Arts, or anything else that mentions monk weapons). "...monk weapons, which are shortswords and any simple melee weapons that don’t have the two-handed or heavy property. You gain the following benefits while you are unarmed or wielding only monk weapons and you aren’t wearing armor or wielding a shield..."
No mention of proficiency, and a pretty clear definition for what counts as a monk weapon. In fact, all monks have proficiency with Greatclubs (for example), but this does not count as a monk weapon, as it is two-handed.